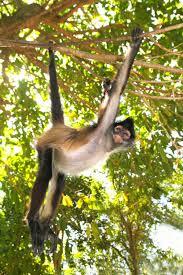 Andres Link has been following and studying spider monkeys for over 16 years. Video also shows some other animals that live in the area and views of the forest they live in. Amazing job in putting this video together. Absolutely fantastic. The monkey's agility in the trees puts me in awe. I love the shots of the babies riding on their mothers back. The photography of the savannas with the herds and forest undercover are also incredible. Thank you for this wonderful video, Marcia.